This listing is for a complete factory SIG SAN 550 / 551 / 552 / 553 rear sight assembly which originally arrived on a demil trade-in kit. The rear sight assembly is black and includes rear weldment. The rear weldment may vary in configuration as some have either 1, 2, or no sling attachment point on them. 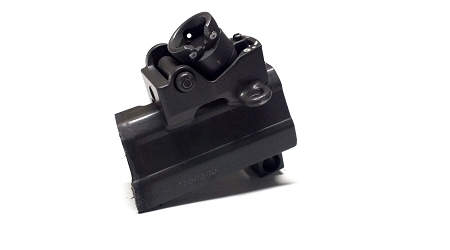 The rear sight drum is adjustable for 4 positions for distance, elevation and windage changes.